Thong Junjin’s performance of “Dawn” has been viewed more than 230 million times. It seems nary a week goes by without some super talented, small Asian child making me feel deficient as a person. And I was feeling pretty good about myself this month, so this was probably overdue. Enter Thong Junjin 汤晶锦 (I’m about 80% sure the ‘h’ is silent). Thong, an 11-year-old from Selangor, Malaysia, is a recent ‘graduate’ of China’s top-rating children’s talent show, Let’s Sing Kids 中国新声代, where she belted out Mandarin and Taiwanese hits by some of the biggest voices in the Chinese music scene, including A-mei, Han Hong and Tan Weiwei. If those names don’t sound familiar, Han Hong was described by one leading music critic as the Chinese-Tibetan love child of Celine Dion and Elton. Praised for her mature vocals and lyrical interpretation, this pint-sized powerhouse is also a viral sensation. Thong’s rendition of Han Hong’s “Dawn 天亮了” has received over 230 million views in just two months. And it wasn’t even her best performance. Watch more performances from the show, including some adorable musical child prodigies, and take part in our readers’ perceptions of adequacy poll, below. Of course, Thong Junjin wasn’t the only freakishly talented member of the Let’s Sing Kids lineup. You may remember 9-year-old cellist Justin Yu from his appearance on The Ellen Degeneres Show. Watch him sing Stereo Hearts by Gym Class Heroes, accompanied by his trusty cello. 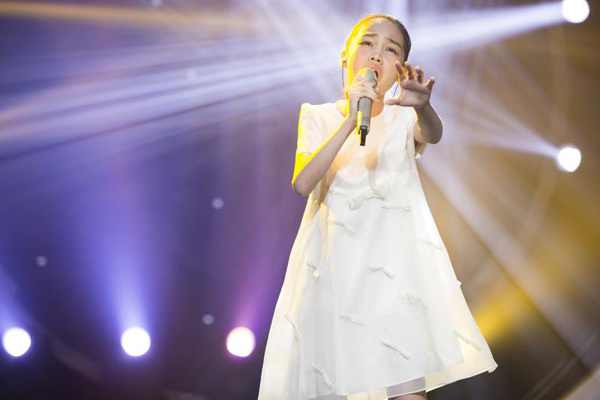 Fourteen-year-old Tan Qian channels a young Faye Wong in her ethereal performance of Incomparable Beauty by Sodagreen. In a guest appearance, Wang Ruizhuo from 2013’s class of Let’s Sing Kids duets with 11-year-old Will Bao. They’re not brother and sister, but they totally look like it. Remember when we said Chinese boy bands were starting younger? Let’s Sing Kids continue the trend with 12-year-old Zhang Qiao, 11-year-old Xie Haoxuan and 13-year-old Zhang Jiahe. What do you think? Do you know of any other super talented child singers? Leave a comment below and let us know! This entry was posted in Mainland China, Malaysia, Music, Television and tagged A-mei, Han Hong, Let's Sing Kids, Tan Weiwei, Thong Junjin by Benji. Bookmark the permalink. Seems a shame she has disappeared after her winning the contest, what has happened to her??? Wang Ruizhuo <3 Why does she not have an album yet. I love her voice, and she's such a great performer. That Justin Yu looks like he’s going to become quite the heartthrob when he grows older. Cfensi, the blog whose main audience is 500-years-old or older.